The dropdown menu doesn't work on mobile-we're working on that! ❀ Our YOUTUBE channel-lots of helpful hits about using your feet for massage! First, let me tell you a little about the Center for Barefoot Massage. With 29 years combined barefoot massage experience with clients, my co-Creative Force (Jeni) and I, along with my husband, Paul, decided it was time for a change in how we wanted to teach barefoot massage. The Center for Barefoot Massage is approved as a provider for NCBTMB, so massage therapists may apply their learning CEU's to their AMTA, ABMP, and state requirements. Our focus is not just on your learning a cookie cutter routine, but how teach therapists how to use their feet with intention like they do with hands-on massage. We teach not only on the posterior side of the body but the anterior as well. (Client’s eyes are covered for anterior Ashiatsu). You’ll learn to easily apply deep pressure to larger muscle groups, which will give your clients comfortable deep tissue work they crave without hurting yourself. Our career saving modality is perfect for clients are athletes, weekend warriors or “regular” people who simply sit too long at a desk and enjoy/need deep tissue massage. The use of the rounded surface of the foot is much more comfortable for the client than elbows and thumbs, and gravity allows for deeper pressure to be applied with less effort. In class, therapists will learn by receiving, performing on each other, working on the instructor and on experienced guest clients. Small class size allows for individualized attention. Therapists will learn safe body mechanics and bar construction, marketing and will have access to an active, supportive graduate group. It’s $670 and 24 CE hours. 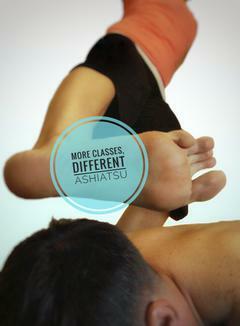 After class, you’ll be able to integrate Ashiatsu barefoot strokes to your existing massage or complete full sessions. We also have a self-study certification process where the therapist will document sessions performed with vital written feedback from practice clients. This 3 day class combo will give therapists enough knowledge to easily perform a minimum of a 90 minute session. This barefoot ashiatsu class is perfect for therapists who can't take more than 3 days off in a row and helps to save on lodging expenses. FasciAshi class is available in Cincinnati (home of the Bengals, Reds, and tons of micro-breweries) with Mary-Claire Fredette. FasciAshi Barefoot massage is an adaptation of ancient forms of barefoot massage. 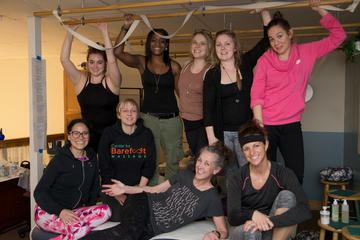 In our style of barefoot massage, bars overhead the massage table are used for balance and support. Why use the foot? The surface of the foot is much larger than the hands, and the heel is wider by a LOT than the thumb! So it's more comfortable for the client. Plus gravity assists the therapist in providing pressure that's deeper than traditional hands-on massage with less effort from the therapist. Deeper + More Comfortable + Easier = Win! The client lies comfortably on a massage table, and lubricant is applied. Barefoot massage Ashiatsu can be very deep and yet feel astonishingly relaxing to the client. In FasciAshi ROM (Range of Motion), the therapist moves the client through a series of stretches meant to elongate and relieve muscle tightness in commonly used muscle groups. She works with the client, always maintaining a "feels so good" stretch. Comfortably lying on a massage table, the client wears loose fitting clothing, and lubricant is NOT used. However, I often incorporate many of these movements with careful draping into my barefoot massage sessions.The ROM class schedule is here.